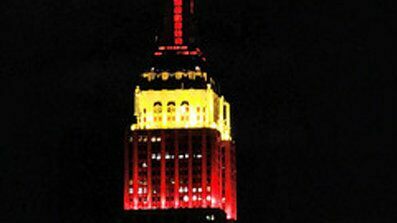 Sept. 9, 2009: The Empire State Building is lit in red and yellow to honor the 60th anniversary of China's communist revolution and the founding of the People's Republic of China. might mean — a holiday, a charitable cause, maybe a Yankees win or a birthday. But sometimes, color turns to controversy. Tens of thousands of people are in an uproar about the building owner’s refusal to light New York City’s tallest skyscraper in blue and white to honor Mother Teresa in August on what would be her 100th birthday. with iconic lightings, and has a tradition of lightings for the religious holidays of Easter, Eid al Fitr (marking the end of Ramadan), Hanukkah, and Christmas,” owner Anthony E. Malkin said in a statement Wednesday. The lay advocacy group Catholic League, which requested the lights for Mother Teresa, countered that individual religious figures have, in fact, been posthumously honored at the Empire State Building: Cardinal John O’Connor in 2000, with the red and white colors of his position; Pope John Paul II in 2005, with the tower lights symbolically extinguished; and famed Baptist preacher Martin Luther King Jr. with red, black and green. An e-mail sent to Malkin spokesman Daniel Hernandez Lyon asking about religious figures being honored was not answered Wednesday. The League first asked for the lights in February and was denied. Anyone can apply to have the building illuminated for what’s dear to them. But the privately owned landmark considers selection “a privilege, not an entitlement,” according to the website with the application form. More than 40,000 people have signed a petition in support of the special lights for Mother Teresa. Cindy Caprio, an aspiring young actor who works as a hostess at a bar facing the Empire State Building, says she spends her night shift at the door greeting guests — and seeing the colors above her change daily. 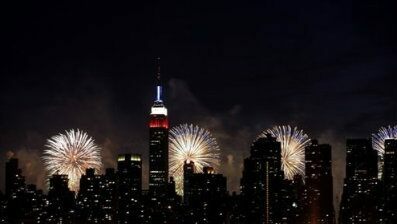 And when she goes home to Hoboken, N.J., across the river, she can still see the Empire State Building, glowing from afar. On Wednesday afternoon, New York City Council members voiced their disagreement with what they see as a snub of the ethnic Albanian nun who worked for the poor and the sick while living in India. She died in 1997 and was beatified by the Roman Catholic Church — a step toward possible sainthood. “I just think it’s a really wrong-headed decision that (Malkin) has made,” City Council Speaker Christine Quinn said. The League is applying for a permit to protest at the foot of the Empire State Building on Aug. 26, Mother Teresa’s birthday, hoping to fill West 34th Street from Fifth to Sixth avenues. Until then, the building will keep a tradition started in 1964 of flooding its highest stories with light from sunset to midnight, using computerized LEDs — light-emitting diodes — that can produce millions of colors and patterns. Decades ago, only nine colors were used, with maintenance workers walking on parapets to hand-install colored lenses on floodlights. Today’s lights are controlled from a computer console, but the magic remains. Depending on the season, it’s blue and white for Hanukkah, red and green for December, yellow and white for spring, pink and white for breast cancer awareness. Last year, the building was bathed in red and yellow — the colors of communist China — to mark the 60th anniversary of its founding. That decision created a controversy that matches the current one. When Frank Sinatra turned 80, the Empire lavished Ol’ Blue Eyes with blue light. A nationwide petition has been launched by the Catholic League after the Empire State Building denied a request to commemorate Mother Teresa’s 100th birthday. Bill Donohue, president of the New York-based Catholic civil rights organization, submitted an application to the Empire State Building Lighting Partners in February to have the skyscraper feature blue and white lights — the colors of Mother Teresa’s congregation — on Aug. 26 to commemorate her centennial. The request was denied without explanation last week, and more than 6,000 people have signed a protest petition in just one day, Donohue told FoxNews.com. Donohue noted that the iconic building in midtown Manhattan changed its colors to red and yellow last year to honor the 60th anniversary of China’s Communist Revolution. Donohue called on Anthony Malkin, owner of the Empire State Building, to reverse the decision. A spokeswoman for the building’s public relations firm declined comment Thursday when reached by FoxNews.com. Mother Teresa, who was awarded the Nobel Peace Prize in 1979, died in 1997 at the age of 87. She was beatified by Pope John Paul II in 2003, a step in the path to being declared a saint.